I love going to bookstores, buying books, and finding a little nook for them in my lovely bookcase. I love everything about books. I just never commit to reading them straight away. So, I've made a little pile to start off with on top of my bookcase, and I'm going to read my way through it. My Sister bought me 'Encyclopedia Of The Exquisite' for my birthday late last year, and I've been itching to read it. It has really delightful illustrations throughout, and its beautifully designed book. I'm a sucker for a good looking book. And Penguin Classics. So many pretty books! I love collecting books. Thanks! Now I just have to read them! 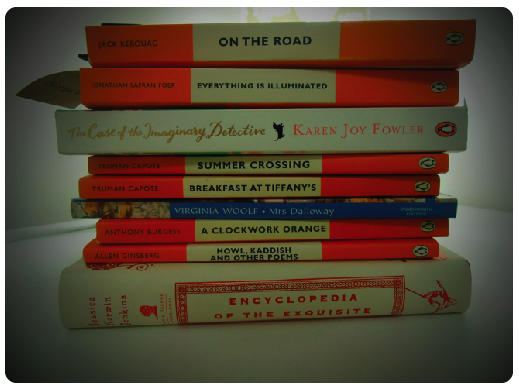 I just love the penguin classics! They are delightful and I am a definitely sucker for the orange covers. I have quite the little collection. Kerouac and Safron-Foer are two of my favss! Can We Sit In Your Truck?